Nebraska Panhandle. 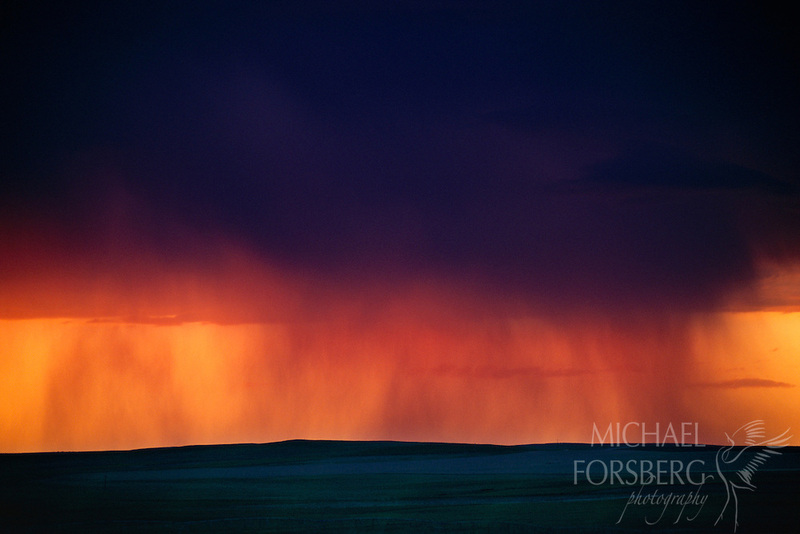 At sunset, a curtain of rain falls from an isolated thundercloud on a lonely sweep of grassland in the Nebraska Panhandle. The Nebraska Panhandle is located in the shortgrass prairie region of the continent, delineated roughly by the 100th Meridian westward to the foothills of the Rocky Mountains. Unlike the tall prairie grasses in the wetter and more humid eastern Great Plains, shortgrass prairie receives less than 18 inches of precipitation annually, and seldom grows more than ankle high. Here in these arid lands, there can be abundant life where true grassland species like the swift fox, ferruginous hawk, pronghorn and prairie dog still survive, and are found in no other ecosystem on earth.